Since LED signs began hitting the market over a decade ago, this powerful messaging tool has grown in popularity among many business owners. LED signs offer flexible, dynamic and high-definition messaging that is simply unmatched by other signage solutions. An LED sign in front of any business speaks volumes about the company's willingness to invest in their company and desire to communicate effectively with their customers. Yet, with all the benefits of LED signs, they are still a significant investment for any business. We work with companies every day to help them recognize an LED sign purchase as an advertising expenditure, rather than a capital investment. Business owners often question whether they can afford to enhance their location with an LED sign and feel constrained by their budget for a capital investment. In fact, LED signs are much more than just an upgrade to a physical location-they are an advertising tool. The Small Business Administration (SBA) cites signs as the most effective, yet least expensive form of advertising for the small business. LED signs in particular are one of the most powerful advertising tools for increasing traffic and sales. Looking at LED signs from this perspective changes the math, literally, and shows why a company's advertising budget should be considered when purchasing an LED sign. There are numerous benefits to LED advertising that are simply unmatched among traditional advertising platforms like television, radio and newspapers. With an LED sign, you can set your own schedule, running messages for as long or as short as you want. You can even switch the message rotation throughout the day. Television, radio and newspapers cannot offer this kind of flexibility, without being completely cost prohibitive. LED signs also give businesses the flexibility to adapt to any changing situation. LED signs can advertise umbrellas during a rainstorm or advertise a special promotion after a local sports team wins. Restaurants with a surplus of a certain food or dish after the lunch rush can advertise a dinner special. The opportunities are endless. No other traditional advertising medium offers businesses this kind of flexibility and adaptability for their messaging. Social media comes close, but frequently a company's "fans" or "followers" are spread out over a wide geographic area. Geographic proximity is another big benefit to LED sign advertising. The opportunity for a company to communicate with potential customers already at their front door is invaluable. We hear from business owners all the time that their LED sign has brought in new customers who report they "saw the sign outside and decided to stop in and check them out." LED sign advertising is an incredibly cost-effective advertising tool. This is measured by calculating an advertisement's cost per 1,000 impressions, or CPM. LED signs have an incredibly low CPM, as little as $0.15, in a typical American town. For comparison, an average newspaper CPM is over $7. A low CPM means a business can reach a much broader audience for less money. The chart below shows a comparison of average audience reach and cost per month of a few traditional advertising mediums versus LED signs. Because LED signs are such a smart advertising tool, we recommend diverting some of your advertising budget to help pay for your LED sign. Many companies find that they can reduce their budgets for radio, television and newspaper ads because their LED sign is so effective. If you are considering an LED sign purchase, do the math. 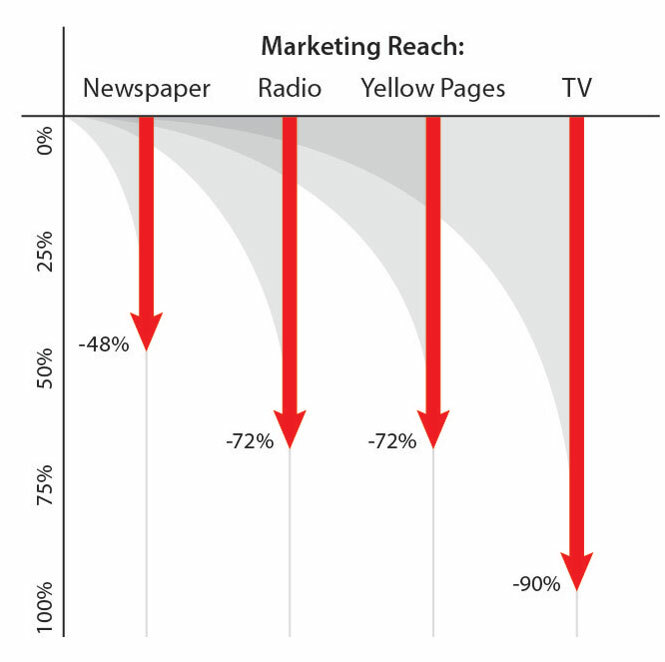 Look at your local advertising options, their expected audience reach and calculate the CPM for yourself. Not yet convinced that you should reallocate some of your advertising budget? As you consider where your advertising dollars should go, it is important to understand how the effectiveness of television, radio and newspaper is changing. Let us look at the recent history of the three prominent advertising mediums. 52 percent of American households have a DVR (Leichtman Research Group, 2012), compared with 13.5 percent of households just five years ago (Nielsen, 2007). 86 percent of viewers skip commercials when watching television (YouGov for Deloitte, 2010). One in every four U.S. households has Netflix, a commercial-free streaming video service, (Frank N. Magid Associates, 2013). Americans between the ages of 12-34 watched less TV during Q4 2012 than they did in Q4 2011 (Nielsen, 2013). 52 percent of adults use their car stereo system to listen to music on their iPod, iPhone or other MP3 device (MarketSource, 2011). In 2012, Pandora registered users increased to 150 million, a 50 percent increase over its 100 million users in 2011. (Pew Research Center, 2013). Newspaper- The decline of newspapers and newspaper advertising is certainly no secret. The industry has been struggling for years to make up for the dramatic decrease in print subscribers. In 2012, print advertising fell by $1.8 billion, an 8.5 percent drop from 2011, dropping for the sixth consecutive year (Pew Research Center, 2013). Some newspapers, like the New Orleans Times-Picayune and the Cleveland Plain Dealer, have been forced to shift from daily printing to a three-day-a-week publication just to stay in business. If you invest in an LED sign as a powerful advertising tool, you will undoubtedly reap the rewards. According to the SBA, small businesses enhancing their signage with an LED sign typically see an increase in business of at least 15 percent. These numbers are consistent with what we have seen in the industry. Every day we speak with customers who have seen incredible results from their LED sign investment-new customers, an increase in foot traffic, dramatic increases in sales and greater recognition in the community. The ROI they see from their LED sign investment helps these companies grow and expand their business, opening new locations and expanding their footprints. As they plan for these new locations, many tell us they consider an LED sign at their new location an absolute necessity. Dave Warns is vice president of on-premise sales for Watchfire Signs, a manufacturer of digital on-premise and outdoor LED signs. He can be reached at Dave.Warns@watchfiresigns.com.